Tonight I will be appearing on Channel Five at 8pm for the Inside Story Programme about life in the community of Westminster - My Role is to help owners be more responsible, respect and care for their dogs!!! I have not seen any 'preview' of the programme so I hope that we all behaved - accordingly. It will show clips of my dog socialising classes in Westminster and the Dog Factor Show in Queens Park, which was kindly supported by City West Homes. 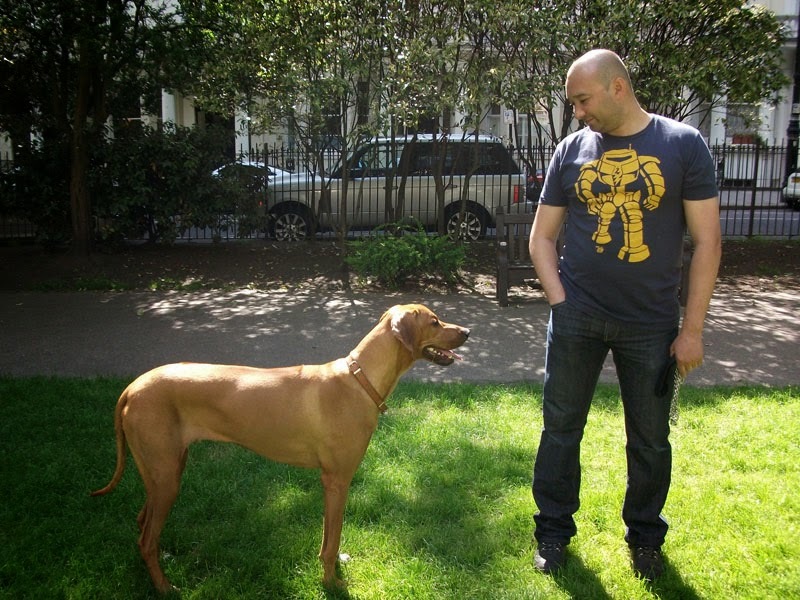 Socialising classes supported by Westminster Council offer 'dog owners' and their 'pets' the opportunity of free training and dog advice, and many resident dog owners were happy to take part. I also hope the programme portrays the 100% commitment needed for being responsible not only for your dog's wellbeing but also for the publics'! In my classes I also discuss environmental issues (ie.picking up after your dog) and the consequences if you DON'T - Dogs being on leads in public areas - again the dangers for your dog as well as intimidation of non dog owners and other dog owners. Neutering and Spaying - the importance but also we discuss the negatives and the positives. Microchipping and Insurance for your pet (covering medical bills and lost or missing dogs). Getting a 'family' pet should be just that a commitment - For Life - so think whether you have the time , (your working hours) holidays - (who will look after your pet) and the exercise (small dogs need sometimes more exercise than big ones) Winter, Rain or Shine! Max with his Community Cup! 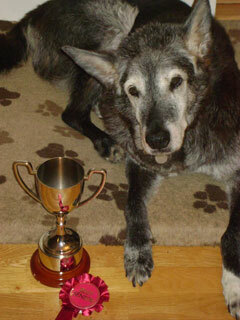 Max with his community cup - Max is 15 years old and has travelled from USA where he was rescued as a pup through to Europe and finally in his twilight years in London UK. Max is a beautiful GSD/Husky mix who with his best friend another senior 'Khan' the staffie promote the gentle loving nature of these breeds - good with all members of the public and other dogs. Max and Khan were joint winners of the 'Community Cup for Dogs' Max shares the cup for six months and Khan shares it for the other six months!! Film crew, Dogs, Councillors and the DOG FACTOR!! I was asked by Fahema Akthar from City West Homes if I would arrange and organise a 'Dog Show' in St Judes Hall for the local community and then was hooked on planning and organising this great event!! On Saturday after weeks of organisation, promotional leaflets and designing dog rosettes for the DOG FACTOR show in Queens Park, London W10 - all the hard work paid off and it was a great success!! This was my eighth 'dog show' event but the first indoor venue where seven 'different' dog categories were mixing together in a confined area!! from Frankie a yorkshire terrier to Ebony a rottwieler standing side by side!!! The categories were Ms Diva - won by Ebony - Mr Slick won by Ollie the retriever - Best Senior won by Khan and Max - Best rescue - Josie the Jack Russell and Frankie - Pup Idol by Alfie the Jack Russell - Best Socialised Dog and Owner - Nico the Akita/Husky. I luv my staffi rosettes were given out to all the 'staffordshire bull terriers' - cause they were all winners. All well behaved and making their owners proud!!! Prizes were bought at Grand Union Pets Chippenham Road W9, who kindly gave me a hugh discount - a big thank you to them!! Rosettes were designed by myself and 'Dog Factor' certificates were given to First and Second Winners. Registration was between 1pm - 1.55pm and the Dog Factor Show commenced at 2pm-4pm . All the time I was observing and supervising the dogs taking part and ready to anticipate any 'anti social doggy behaviour'. Meanwhile being filmed for Channel 5 by the Production Crew who also were asking me questions about the 'event' and 'dog issues'. I did forget I was wearing a microphone all the time I was directing 'dogs' and owners' to the stage when the categories were called!! There was a 'special cup' awarded to Khan the staffie/x and Max the Husky/GSD for their 'work' in the community - promoting 'socialisation with other dogs and people in the community' and promoting 'Its not the Breed - Its the Deed'.